Forget flood insurance. Nervous homeowners of America's coastal regions can now hedge against disaster with the help of BetUs.com. The gambling website is now taking wagers on over 20 global warming scenarios. Polar Bears will become extinct by 2010... Bet $100 to win $15,000. Should you be lucky (unlucky?) enough to cash for $30,000 on "Water World," good luck finding an ATM...or Kevin Costner for that matter. But, hey, if we're going to go down with the ship... why not do so a few bucks richer? A 68 million-year-old drumstick was pulled from the earth. Over the last four years, scientists poked, prodded maybe even tasted it. 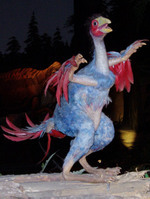 Reuters reports: "a comparison of the protein's chemical structure to a slew of other species showed an evolutionary link between T. rex and chickens, bolstering the idea that birds evolved from dinosaurs." You tell me... is it evolution...or a finger-lickin'-good fantasy?